Free shipping over RM 50 purchase. 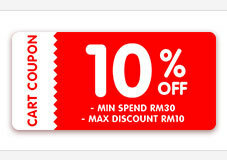 Shipping fee is free when purchasing above RM 50 in a cart. Received in good condition with a free gift. Thanks. Dear Sir/Madam, our free gift is random. Thank you. Dear Sir/Mdm, we have new stocks coming in every month and we are unable to provide the exact expire date for this products. However, the current stock expiry date is end of 2019.